On 26 Jan. 2018, six graduates from the International Space University arrived in Colorado to meet as a Crew for the first time. A group of space experts from the fields of science, engineering, innovation, education, and arts we each embrace an interdisciplinary, international and intercultural framework perspective to space grand-challenges, and share a love for the red planet. The connection is instant and familiar. Together we have accepted a mission to the Mars Desert Research Station [MDRS] in Utah to participate in the Mars Society analog mission from 27 Jan – 11 Feb 2018 as ISU Crew 188. We commit to living together in analogue conditions, undertaking collaborative research in situ, and taking steps towards our loftiest dreams for life on Mars. In the blink of an eye, we arrived in Utah. Members of the LatAM Crew 187 collecting water and disposing of water in the nearby town welcomed us. We convoyed to the MDRS site along an unpaved road between an ancient canyon of red and golden rock formations. In that moment, our excitement built: we had arrived on Mars, and our energies grow. We explore the main habitat, the greenhouse, the new science laboratory, an observatory, solar cells, the ATV engineering lab and the surrounding area. Naturally, the crew had very little sleep with the excitement of all that lay ahead, but by Sol-1, the experience of the first EVA-simulations today’s cemented our resolve. 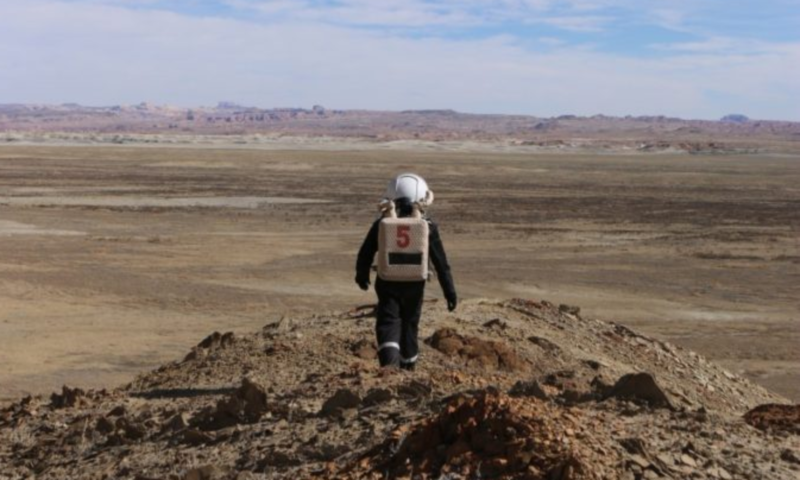 Our mission to the “Marble Ritual” Site Waypoint 6 served two purposes: to test systems from communications to suits and transport integration, navigation, communication and familiarization of the terrain…and engage us in the humor of the Mars Society. EVA 1 Crew was awe-struck to discover signs of life on the red planet the moment that they left their RTVs: big cat (cougar?) tracks, shards of rock like spear tips, photographed and GPS located before the traverse to the installation of three musical instruments. We peered into the dandelion-like metal stems, and found the precious marble eye, and tested our Final Frontier Designs EVA Spacesuit Gloves, and Artist Boogie Board Drawing System, Cameras, Maps and other attachments. While the EVA-2 problem-solved some interesting challenges with visibility and navigation, they succeeded in demonstrating a successful evacuation and coordinating the crew to meet the goals safely and professionally. Knowingly entering the simulation, we play out the socially coded nature of our crew behaviours to support the design of collaborative research challenges which test the fidelity of our response to imagined Mars-like stressors. The red planet represents our passion and insatiable curiosity for space exploration and discovery. So too, the MDRS Simulation amplifies their collective fears and desires for liberation and exposure to out of this world experiences. There are obvious challenges and learning curves ahead, but we realize the scope of our mission and choose to accept it. Here, in this incredible landscape, and brought together through the limitations and requirements of essentially a Mars-life life, we have stepped into another world: not only in our imaginations but through the investment of our hearts, minds, and bodies. We will sleep well tonight.